Because there were so many apples, I decided to make apple pies. This was not a decision made lightly, as I've never made an apple pie before. But I tend to approach new activities with a sense of fun and adventure, not fear (another metaphor for how we live our lives), so I Googled apple pie and selected a recipe that looked good. I searched for my rolling pin to make crust, and remembered the wise words of my grandmother, when I once asked her how to make pie crust. She said, "oh honey, I haven't made my own pie crust in years. I use the store bought kind." So I followed grandma's lead and bought some ready made pie crust, already in the tins. The metaphor here? Don't try to reinvent the wheel and follow the advice of your wiser elders. I then proceeded to peel the apples. One at a time. Like any project, it begins with the first step....or apple in this case. You can only do one step at a time, or peel one apple at a time. Persistence is the key metaphor here. I then sliced my apples using my handy Cuisinart. No metaphor here, except life is sure easier with appliances! I seemed to have a lot of apples. An abundance of apples! I ended up having to double the recipe, and still had apples left over. 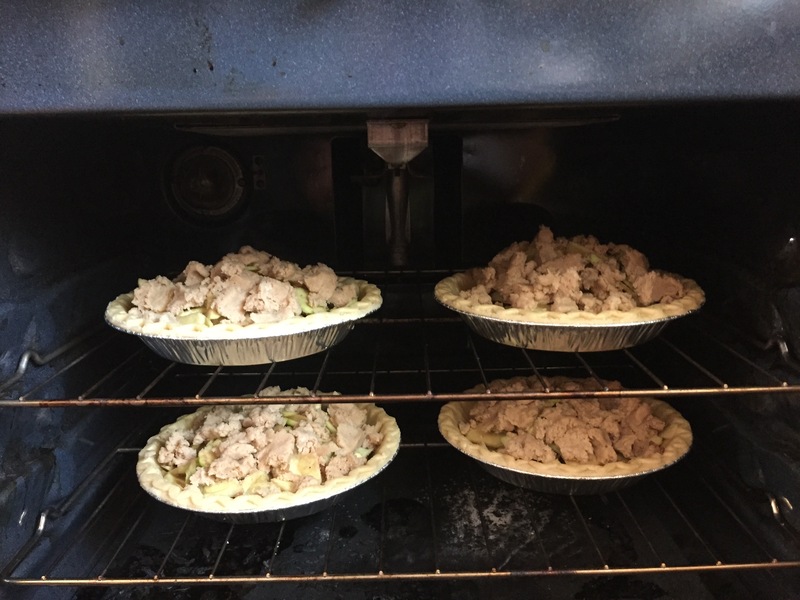 In doubling the recipe all sorts of unexpected things happened: I found I couldn't use the second pie crust as the lattice top layer, as I had enough apples for all four pie tins. So I decided to make crumb topping instead, Googled the recipe, and promptly ran out of brown sugar. So I improvised with white sugar. Two metaphors here: go with the flow and be willing to improvise if necessary. Everything went together fairly nicely, even though I was a bit doubtful about the outcome what with all the improvising. I baked the pies, and bought one to my green thumb neighbor, who didn't even get a plate. He dug in immediately with a fork, standing in the middle of his backyard, and prounounced the pie perfect. And I didn't believe him. The metaphor here? Sometimes we push away our own good with beliefs that aren't true and don't serve us. I didn't say anything. I gave another pie to my other neighbor, and another to the ladies at the barn where I ride my horse. 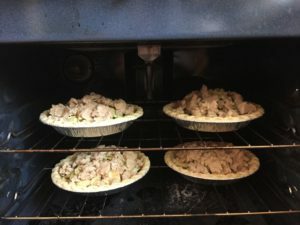 Even though I was still doubting whether or not these pies were even edible, I enjoy cooking for people and giving the things I cook away, so I did it anyway in spite of my misgivings. Notice I haven't even tried my own pie out yet. The metaphor? Don't give into your doubt. That night, I ate some of my own pie for dessert. While I am noticing some room for improvement, I thought it was quite good. And I ate another slice the next day. And the reports have come back: the pies are indeed very good. And so I finally felt good about my accomplishment. How long does it take you to believe in yourself and feel good about an accomplishment? The pie adventure continues. 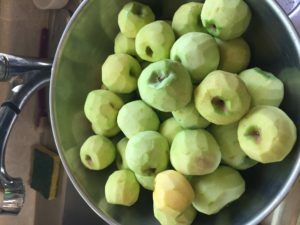 I went today and picked some more apples. I'm off to the store for more brown sugar and pie tins. I will make some adjustments to my recipe, based on the characteristics of these particular apples (they are very tart and a bit dry) and make some more pies. The abundance continues! The giving will continue! And the enjoyment of the entire process continues! I hope you are having a wonderful fall! Previous article:Be the Greatest Expression of You!